Visit a wonderful Gothic church with a fascinating history and many significant architectural features. This important building still draws pilgrims today. Get a sense of Maria Wörth’s long history and rich religious background at the St. Primus and Felician Parish Church, also known as St. Mary’s Church. This traditional white building occupies a dramatic position on the peninsula that juts out into scenic Lake Wörthersee. It is a simple yet astonishingly lovely example of the classic Gothic architecture that makes this part of Austria seem so idyllic. A church was first documented in this spot well over 1,000 years ago. It gets its name from the martyrs St. Primus and St. Felician, who are believed to have been buried here. Visit today, however, and you will find only a few signs of these early days. Fire destroyed the church in 1399 and it was rebuilt almost entirely from scratch in the early 15th century. Explore the wonderfully atmospheric cemetery and the beautiful exterior of the building before you head inside. Wander among the crosses that mark the graves and look out for one of the oldest parts of the church, the south entrance. Parts of this entrance date from the 12th century. Step inside the church and admire the Baroque detailing of the altar, which is around 200 years newer than the exterior of the building. Descend the stairs to the crypt in the basement, where the relics of St. Felician and St. Primus are still thought to be buried. Compare the interior of the main church with that of the Winter Church, which is located nearby but has a more modest, yet still beautiful, design inside. Take time to look carefully at its beautiful 12th-century frescoes, which are a highlight of this smaller building. Visit the St. Primus and Felician Parish Church in the summer to make the most of the beautiful Lake Wörthersee. This sparkling body of water is a wonderful place to go swimming or boating, or simply to take incredible photos. Fly into Klagenfurt Airport and then reach this tranquil and deeply significant place in less than 30 minutes by car. 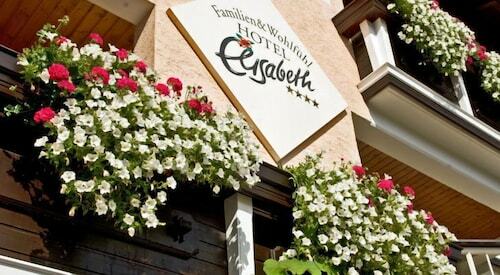 Situated in Maria Woerth, this hotel is within 9 mi (15 km) of Minimundus, Landhaus, and New Square. Dragon Fountain and Carinthian Botanical Center are also within 9 mi (15 km). 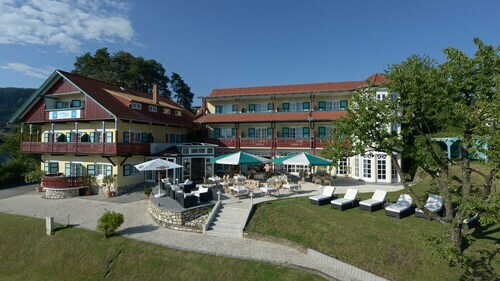 This Poertschach am Woerthersee hotel is on the beach, 0.1 mi (0.1 km) from Worther Lake, and within 6 mi (10 km) of Minimundus and Happ's Reptilienzoo. Strandbad and Maria Loretto Beach are also within 9 mi (15 km). 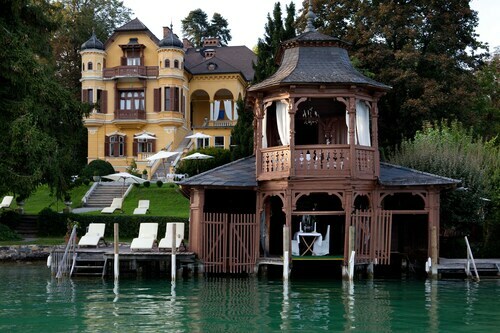 This Poertschach am Woerthersee pension is on the beach, 0.1 mi (0.1 km) from Worther Lake, and within 9 mi (15 km) of Strandbad and Maria Loretto Beach. Carinthian Botanical Center and Schiller Park are also within 9 mi (15 km). 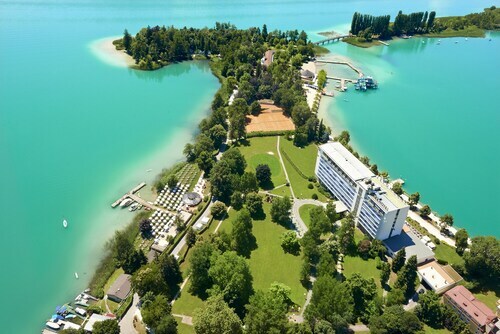 Situated near the beach, this hotel is 0.1 mi (0.1 km) from Worther Lake and within 9 mi (15 km) of Casino Velden and University of Klagenfurt. Happ's Reptilienzoo and Minimundus are also within 9 mi (15 km). Pörtschach Am Wörthersee Station is 16 minutes by foot. 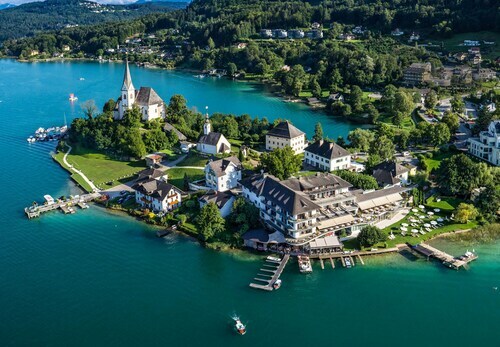 Situated in Poertschach am Woerthersee, this luxury hotel is 0.1 mi (0.1 km) from Worther Lake and within 9 mi (15 km) of Casino Velden and Minimundus. Happ's Reptilienzoo and University of Klagenfurt are also within 9 mi (15 km). Pörtschach Am Wörthersee Station is 13 minutes by foot. 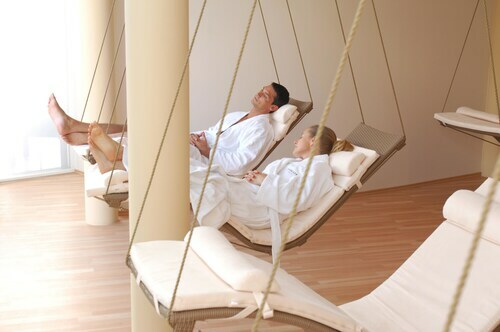 This Poertschach am Woerthersee hotel is on the beach, 0.1 mi (0.1 km) from Worther Lake, and within 9 mi (15 km) of Strandbad and Maria Loretto Beach. Goethe Park and Carinthian Botanical Center are also within 9 mi (15 km). Pörtschach Am Wörthersee Station is 8 minutes by foot. 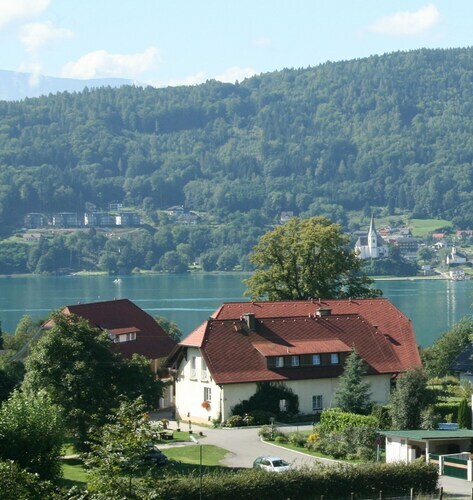 This family-friendly Poertschach am Woerthersee hotel is located near the beach, 0.1 mi (0.1 km) from Worther Lake, and within 9 mi (15 km) of Happ's Reptilienzoo and Minimundus. Strandbad and Carinthian Botanical Center are also within 9 mi (15 km). Pörtschach Am Wörthersee Station is 15 minutes by foot. Situated in Poertschach am Woerthersee, this hotel is 0.1 mi (0.1 km) from Worther Lake and within 9 mi (15 km) of Casino Velden and Minimundus. Happ's Reptilienzoo and University of Klagenfurt are also within 9 mi (15 km). Pörtschach Am Wörthersee Station is only a 5-minute walk.